This series of performances were first initiated when I was an artist in residence at the Denver Art Museum in the Spring of 2013. I attended school at Northern New Mexico College for a certificate in Automotive Science, Auto Body. I finished the body work and paint on “Maria” the 1985 El Camino, in time to do a first Friday performance at the Denver Art Museum with the Post-Apocalyptic Indigenous Warrior garb that I had created there in the Museum. I drove the el Camino up toward the museum flanked by indigenous and gender-queer performers in accoutrements made of found objects, leather, metal and fired clay. A heartbeat bumped out of the thousand-watt speaker system installed in the El Camino. This was the first performance of its kind, as an attempt to deconstruct gender roles around car culture, and to challenge the sexualization and objectification of indigenous women. Pomona College Museum of Art invited me to curate work from their collection of artifacts, and to make work in response to the collection. I chose a collection of grinding stones and built two large figurative pieces, one standing witness and one with large wings reaching into the earth. The concept stemmed from the belief that these post-apocalyptic indigenous giants have the ability to rise above their realities, but as they are told by the ancestors, they must go below, go within, go into the earth and discover the strength of work and nourishing stones. 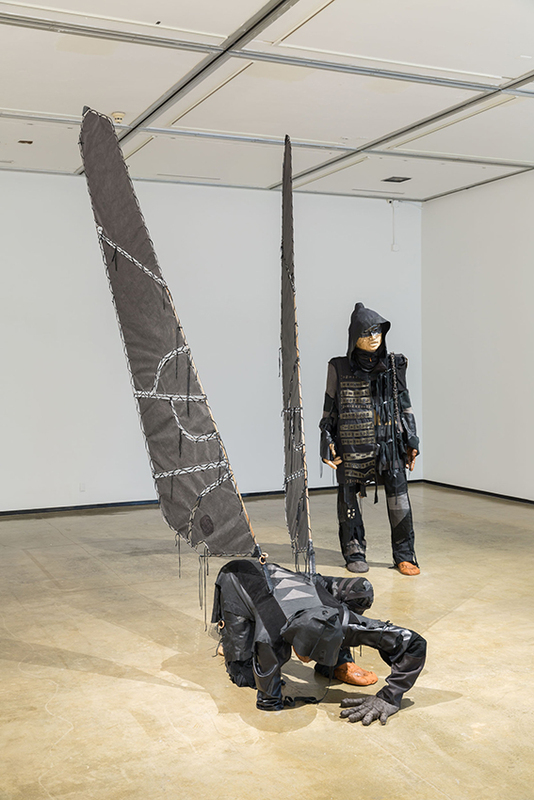 These two figures, over nine feet tall, were installed in a large room facing each other. This initially was based on the concept of creating a ‘sacred space’ and I ended up presenting what I believed was an altar, or an altering moment- the moment of connection or awareness with another.